From a fund-raising event in Hastings last year. Among the 50 or so lots to be sold at the auction, which begins at 6pm, is an England away shirt signed by Wayne Rooney, as well as signed books, DVDs and photos of celebrities from sport, film, TV, music and even politics, the charity says. Among those who have donated items to the auction are Deep Purple, Ridley Scott, Michael Palin, Helen Mirren and Stephen Fry. There will also be food tastings and a raffle. 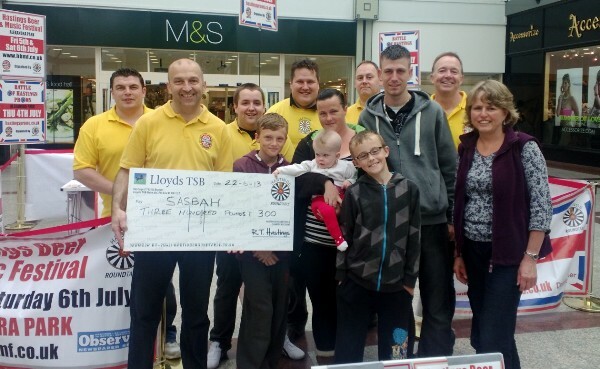 Horam-based Sasbah is now approaching the end of its year as M&S Bexhill’s designated charity, and the auction represents the grand finale. Monies raised will be match-funded by M&S head office. “This is a tremendous opportunity to raise awareness as well as funds specifically for our work supporting families with children with spina bifida and hydrocephalus,” said Sasbah CEO Rom Sanglaji. The full catalogue can be viewed on the Sasbah website (under news). Charity Auction of Signed Memorabilia in Aid of Sasbah M&S Bexhill, Ravenside Retail & Leisure Park, Bexhill-on-Sea TN40 2JS, at 6pm on Tuesday 21 March. To register your place email Bexhillmandscharityauction@outlook.com with your name and any guests.